Fuego Brew Co is a hidden jewel ready to be discovered by beer loving travelers and local Ticos alike. A craft brewery located on the southern pacific coast of Costa Rica in the tiny bohemian beach town of Dominical, just a quick 30 minute drive south of Quepos. Built using beautiful local and sustainable materials, Fuego is a sight to behold. A giant bamboo ramp leads up through the jungle to the second floor where beautiful breezes and views of the river, ocean and jungle await. A glass bottom floor looks down upon the brew house, where top-notch brewing equipment ensures the beer is always fresh and delicious. Toucans, Scarlett Macaws and a huge variety of other jungle creatures call the land surrounding Fuego home and are frequent visitors. Fuego’s resident brew master, Alan Struck, honed his brewing skills at San Francisco’s Anchor Steam Brewery and Maui Brew Co before bringing his knowledge and passion about craft beer to Costa Rica. The result? Fuego makes the best craft beer in Costa Rica, hands down. An ever-evolving menu chock full of organic vegetables, local chicken, house- made sauces and sustainably sourced seafood matches well with the 6 different varieties of house-made brews. Fuego’s most popular brew is the Guanbana Hefeweizen and should not be missed. Especially when paired with some home-made beer battered onion rings and seared tuna. So take the adventure and experience Dominical and Fuego Brew Co for yourself. Look for it on the banks of the Barú River, a stone’s throw away from playa Dominical’s powerful waves. Across from the schoolhouse there’s a big wooden gate and believe us when we say once you’ve been to Fuego, you’ll never forget it. Click the PLAY button to listen to Letty, Lance, Niven & Ed. My name is Ed Hooven. For decades my late wife Maya (who died on Feb. 3rd, 2017) and I were good friends with Lance, Letty and Niven. Our friendship was in part based on our mutual interests in playing and listening to live music. I write this with tears in my eyes as I am the last survivor of this group (born one month after Letty) and have recently been lost in my memories while listening to the hours of recordings we made in our Toronto music room and on gigs (many with Lance, Letty and Niven) since my wife’s recent death from a second bout with cancer. But let me go back to the beginning: It all started in 1968 (as I learned from Maya) that a new Canadian named Lance Bennett arrived in Toronto’s Yorkville (the then hip area of the city). They immediately struck up a friendship with Maya hiring Lance to work at her club the “Penny Farthing” coffee house. While the club closed shortly after that Maya took Lance with her to the several other Yorkville venues she worked at in those years. They stayed in touch over the next 15 or so years while Lance traveled intermittently to places like South America and England. Envision Festival is a conscious festival dedicated to awakening human potential and re-establishing our fundamental connection with nature. Taking place February 23rd-26th 2017 in beautiful Uvita, Envision has grown to become one of the most progressive festivals in Latin America. In its seventh year, Envision continues to flip the traditional festival model on its head. Four days of yoga, surfing, performance, music, educational workshops, and community building will continue to elevate this gathering to one of the premiere festivals in the world. Envision embodies the ethos of the most recognizable transformational festivals, while also taking huge steps in the direction of sustainability. Partnering with Costa Rican based non-profits like Community Carbon Trees, festival organizers have systematically reduced the carbon footprint of the event, working hard toward the ultimate goal of carbon neutrality. In 2016, more than 200 trees were planted on-site at Rancho La Merced by attendees and volunteers in an effort to offset the carbon footprint of international travel. Envision is also one of the only events on the globe that has created system to deal with human waste. Instead of continuing the portable toilet model used by most high-attendance events, the Envision green team has built and implemented over fifty semi-permanent compost toilets on site. The saves an estimated 28,000 gallons of water and generates enough compost to fertilize the plethora of fruit trees at Rancho La Merced for most of the year. The Manuel Antonio region is a natural gem, amongst others in Costa Rica, blessed by possessing a hyper rich Biodiversity. Ponce de León, the Spanish explorer, whose futile search for the Fountain of Youth became his signature expedition, is rarely recognized for one of his greatest discoveries—Quepos and Manuel Antonio—which he put on the charts in 1519. Surrounded by African Palm plantations, this area beholds one of the country’s most enriched ecosystems. Sloth, monkeys, birds, deer, frogs, raccoons and many more popular characters are found here. It’s a transition Jungle in between the harsh Tropical Dry Forest, and the evergreen Extreme Wet Forest. The people of Quepos look forward to serving you and telling you about our town, a typical Costa Rican pueblo. Quepos provides access to all amenities, such as Supermarkets, ATMs, Post Office, Doctors, Dentists, Taxis, Buses, Souvineers, Shopping, Restaurants, a Casino and much more. Quepos is safe and friendly. The people living here go out of their ways to be helpful, often speaking English as well as Spanish. So spend some time and enjoy shopping, dining and having a drink. The streets have been recently repaved so walking and driving are easy. Quepos is on the ocean front and the boardwalk is the perfect place to sit and relax. There is an open-air market on Friday evenings and Saturday mornings with lots of exotic local fruits and vegetables. 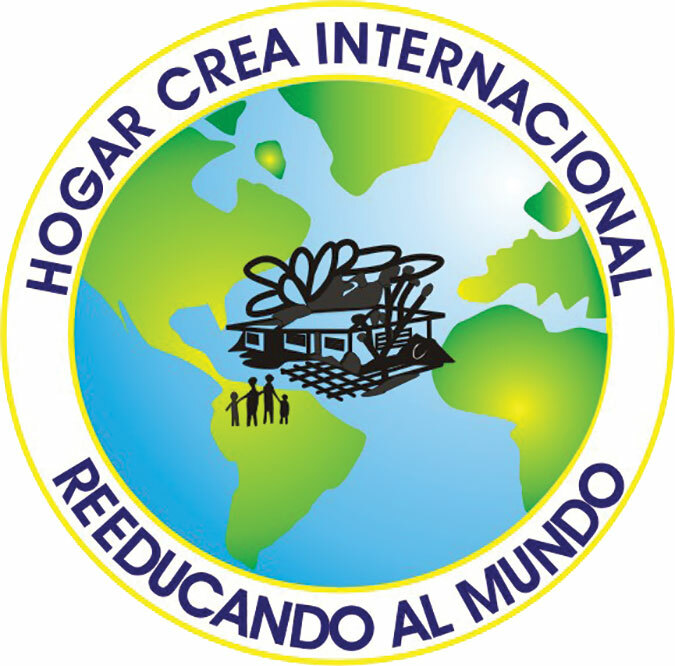 What is Hogar Crea ? Hogar or Home is a refuge for people who have been using drugs and who want to turn their lives around, also for Alcoholics, and those who are homeless and in need of help. One of these houses is located in Paquita (Hogar Crea) & relies on donations of food, furniture, housewares, and of course cash to pay for electricity etc. The house in Paquita is for men and you will see them in their chrome yellow Tee Shirts around town canvasing for donations. They are also available to do yard work, painting, & some types of work. Call the House at 2774-0410, or if you would like to volunteer & work for the steering committee call 2777-3671. Ticos Shine Bronze & Make History in Jaco! Congratulations to our Costa Rican surf team who took third place in the ISA World Surfing Games in Jaco, the finals of the 2016 Aloha Cup! For eight days, the eight teams gave it their all as they paddled for the gold through the heat and choppy waters. The Tico team, defending world champs from last years competition, received an incredible turnout and endless support from their fans who have traveled near and far to back the team. Locals and travelers from all over the world lined the beach in Jaco to celebrate the marvelous talent and skills that are displayed by our Tico team and other countries represented in the competition. 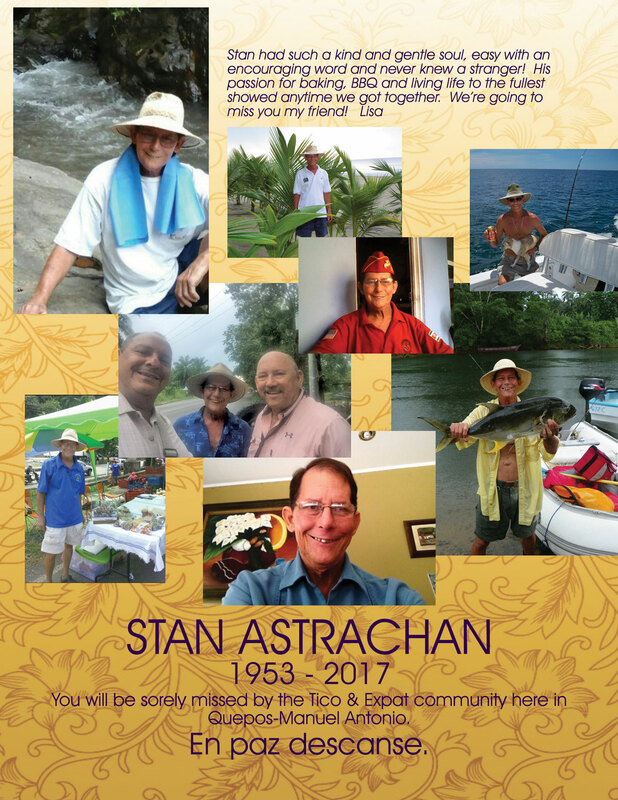 Letty Anderson, longtime Quepos resident and bassist in a number of local bands, died on May 9, 2016 from endometrial cancer. She was 72. She described herself as a “Bassist, economist and feminist. In that order,” though the song of her life played out the other way round. She was born Letty Donaldson, the daughter of the local district attorney in East Peoria, in central Illinois. Though the youngest and smallest of three children, she had no trouble sticking up for herself. According one family story, she and her sister Cindy got into a fight one morning before school, and in a melee of swinging fists, she gave her sister a black eye. After her sister went to tell mom, the two of them fought again — at which point Letty gave Cindy a second black eye. One thing for certain about Costa Rica’s coffee industry is that it is dominated by men. So what would cause three Portuguese women to move to Costa Rica, buy a remote coffee farm, and run it independently from the many cooperatives in the country? “As young girls, we grew up on a coffee farm in Angola. When Angola became dangerous during their civil war, we moved with our parents to their birthplace of Portugal. We always had this dream of returning to our roots and owning our own coffee farm. When thinking about moving to Costa Rica we researched the possibilities for many months before finding a non-working finca at the optimum altitude and with the right volcanic soil and climate for sale” remarked Ana Gomes Da Silva, one of the 3 owners of Finca Las Duenas (Duenas is Spanish for female owner). They knew it would take a tremendous amount of work to even get to the point of producing coffee trees but it became their passion. The time has come for me to begin a new chapter in my ‘Book of Life’. In January I will be returning to the US permanently due to family needs. ‘Sure, I’d be honored to join the PAWS Board’, I said. It didn’t take too much thought. 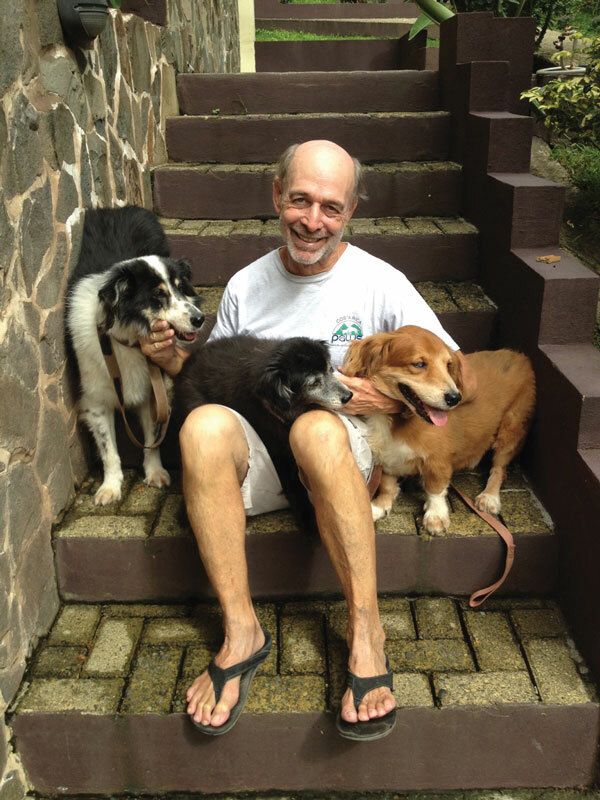 I am an ardent animal lover and had been volunteering with the group. I always want to give back to the community in which I live and being retired I’ve had plenty of time to do so. Hello, this is Jill (the sloth nanny), reporting from the sloth nursery at KSTR where The Sloth Institute is working in collaboration with KSTR to raise its baby-orphaned sloths. I’ve been volunteering here for about a month, working night and day to take care of the eleven sloths currently in rehab. Sloths have seen a popularity explosion thanks to some viral internet videos, but few people realize that it takes a tremendous amount of time and dedication to raise and release them back to the wild. My daily routine starts at 7 am with hand-feeding all of the baby sloths. Eight of the eleven sloths are less than a year old and need frequent feedings and monitoring. Most things are slow with sloths, including their ability to drink the milk from the syringes. The feedings take patience, as hand-feeding all of the babies can be an almost two hour event. All together, there are four milk feedings per day, with one of those being overnight. This changes if we receive an infant sloth. They need feedings every two hours, around the clock. Between the late nursery feedings, I leave to take care of the two adult sloths, Ellen and Kermie, that are to be released this year. They are nocturnal two-toed sloths so each evening we hang fresh leaves and vegetables around their enclosure for them to find. Need to make a residency run to Panama or just want a change of scenery? There’s much more to Panama than the towns that border Costa Rica, David and Bocas. 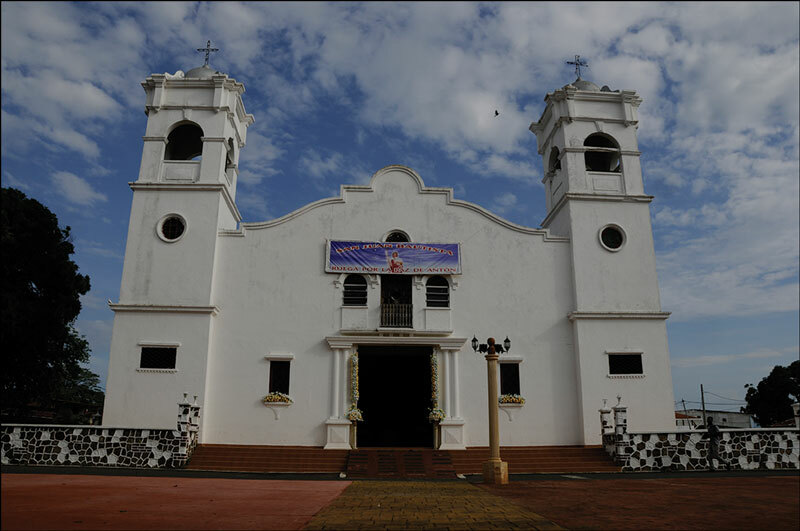 Why not take a leisurely ride along the inter-american highway to the town of Antón and experience more of Panama? Just past Penonome, Antón is situated in the plains just minutes from mountains and beaches, about five hours from Paso Canoas. 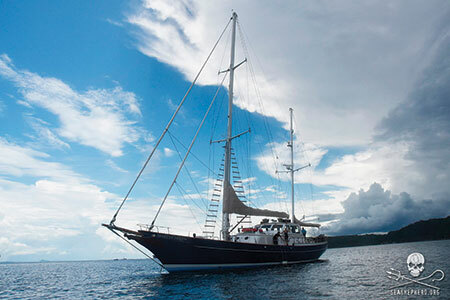 The sailing research vessel the R/V Martin Sheen has arrived in Costa Rica, where Sea Shepherd has begun an ocean research and public awareness campaign. On August 8th, they held an ”open house” on the Martin Sheen at Marina Pez Vela. The mission of the vessel is: Defend, Conserve, Protect our ocean. This was a unique opportunity to meet the Sea Shepherd volunteer crew members and understand what life is like out at sea. The crew was friendly and attentive, and visitors took great pictures and listened to amazing stories. Live music started at 4pm with Nativo, a band from San Jose. Also, local artist Carlos Hiller showed his live art paintings.